In this example, we have a control field called Lock Record and two data fields. The admin password can edit these two fields at any time. it will not allow that user to modify the information in that field. We set the field so the user cannot override the validation and to give the user the following message with validation fails. I’ve included two buttons to allow you to quickly toggle between the two access accounts for testing. 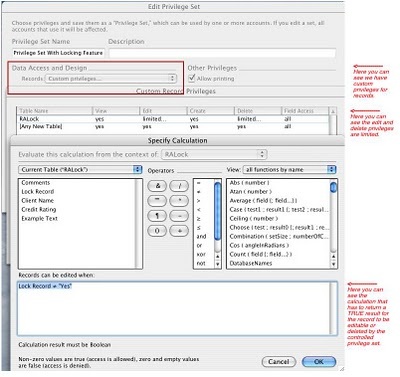 Here you can see the three privilege set dialog boxes for setting up this example.